If you are a business in Houston looking into the possibility of implementing corporate commuter shuttles, congratulations! You’re in the right place. 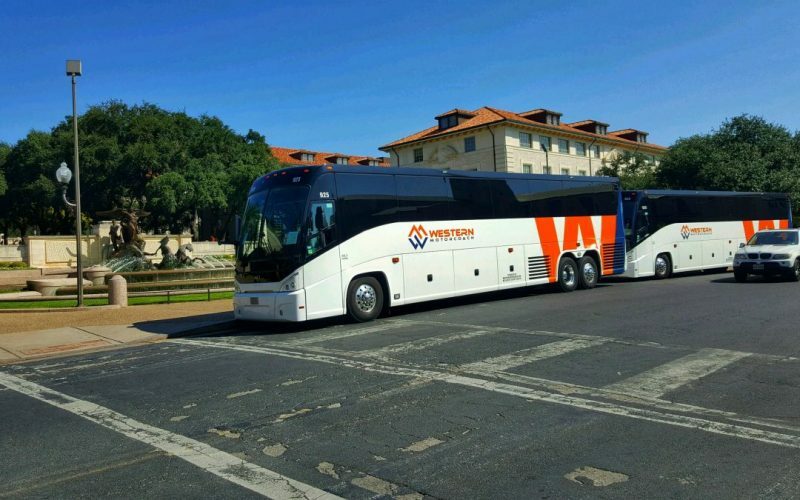 Western Motorcoach offers a corporate commuter shuttle service to companies in the Houston and surrounding area who are looking for a way to delight employees, cut down on congestion, and solve parking woes. But does it make good business sense to implement corporate commuter shuttles in your company? Let’s take a deeper look. When you offer corporate commuter shuttles to your employees, you free up the time of their day that they would otherwise have to spend driving to work. Sure, they’re still stuck inside a vehicle, but their focus can now be directed away from the traffic and towards more profitable ventures. Think about the amount of time that’s lost at the beginning of each day when stressed-out employees are still decompressing from their frustrating commute and trying to get their heads in the game by checking email or moving slowly through the first few tasks of the day. This initial ramping-up period is known to be a big drain on productivity, and a slow start to the day can not only mean lost production during those first few hours, but also trigger a sluggishness in the entire day. When your employees get a head start on their work by getting through their emails and initial tasks while they’re still on the shuttle, this can give them extra momentum that lasts all day long, resulting in significant gains in output for you. Is recruiting top talent a top priority to you? Is your HR department constantly looking for techniques to attract the applications of the best and brightest of Texas? If there’s one thing for sure about the most intelligent echelon of the workforce, it’s this: smart people don’t like to be bored, and driving is boring. Yes, your most talented individuals are probably listening to audiobooks or doing mental arithmetic in their heads on their daily commute, but what would they be doing on their way to work if you freed up their brainpower even more by giving them the bonus of not having to drive? The thought of that could have potential job seekers salivating over the possibilities. Every vehicle on the road has a certain probability of having an accident, and with the number of automobiles driving to work in an area as densely populated as Houston, accidents are a daily occurrence. Not only do your employees have to navigate around those accidents on a daily basis if they’re driving to work, they’re also potential victims of accidents themselves. Having one of your workers get in a bad car accident is not something you want. It means lost time and productivity, increased insurance claims, and potentially needing to fill the position with a temp or new hire. People generally tend to be safer in a shuttle bus, because even if they do get into an accident, there’s typically a lower incidence of injury and loss of life to passengers on the bus than to occupants of an automobile. Every employee who has to drive to work must pay for all the costs related to owning and operating a vehicle, including the price of the vehicle purchase, fuel, insurance, wear-and-tear, tolls, and parking fees. We all know that in Houston, none of that is cheap. When you allow your employees to switch to riding the shuttle to work, you’re saving them all the miles per year that they would have driven, resulting in a net effect that they can either consider to be a salary boost or a savings boost. It’s not hard to see how your employees will be delighted with this. Curious If Corporate Commuter Shuttles Will Work for You? If you are considering implementing corporate commuter shuttles at your workplace or office, it’s a great idea and you probably won’t be sorry you did it. However, if you want to make absolutely certain, it’s never a bad idea to run the numbers to make sure. A small-scale proof of concept can allow you to test the launch of your corporate commuter shuttle program before deploying it as a full-scale employee perk. If you’re unsure about the benefits of implementing corporate commuter shuttles, why not launch a test run for a month or a quarter. Gather data and then present your findings to the decision makers. You won’t have lost much money, but you will have a case study that you can apply to predict how well these shuttles will work when you expand the offer to the rest of your team. To calculate the potential impact that corporate commuter shuttles could have on your bottom line, multiply the number of employees who will ride the shuttle by the number of hours per week that their shuttle trip will add to their ability to get started earlier on their work. Correlate these hours to the potential financial impact of their productivity, divided by their salary. Also, subtract the amount of savings that each employee stands to gain by reduced fuel consumption, wear-and-tear per mile on the car, and daily parking fees from the cost per day of hiring the shuttle. If the numbers show that you come out ahead by implementing a corporate commuter shuttle, it’s a clear win. If it comes out approximately even (neither gaining nor losing you money), it can still be a win when you think of it as an employee perk that can make it easier for you to land better talent. If the numbers show that you would be losing money, calculate the number of employees you would need per shuttle in order to swing it. It may be that you can implement corporate commuter shuttles down the road, maybe just with the addition of two or three new people riding the shuttle. To get started with your shuttle service from Western Motorcoach, simply contact us from a quote. It’s easy to work with us, and you’ll love the high-quality fleet of climate-controlled, wifi-equipped shuttles that we offer so that your employees can travel to work in comfort. No matter where your employees live, we can help. Contact us today.